Carries Your Gear with Ease! Got drums, keyboards, PA, or DJ racks to move? Do your fellow band members vanish into the night at load-out time? Here's help on wheels! The Rock N Roller R6 cart is tough enough to handle 500 pounds of gear. Yet it only weighs 25 pounds to make it easy to manage! The Rock N Roller R6 cart changes shape to meet your gear-hauling needs! Its 8-in-1 flexibility allows you to use the R6 as a conventional 2-wheel hand truck or a 4-wheel carriage, all with a few quick adjustments. And here's the best part: the R6 changes from 2-wheel to 4-wheel mode in about two seconds! This cart will quickly become as cherished as your favorite roadie. The R6 features some Rock N Roll exclusive designs. The R6's non-skid frame bed surface resists load slippage. In addition, the folding sides rotate and lock into position by simply pressing release cables. In 2-wheel mode the R6 hand truck's long nose ergonomically pulls bulky loads toward you to make lifting easier. The Rock N Roller R6 uses patent-pending Flat Free swivel casters that are very lightweight, strong, and have a special dampener to resist wheel wobble. They also feature quick-change pop-off wheels for smaller storage profile and easy service in the field. The R6's Flat Free wheels absorb shock to delicate equipment and smoothly roll over rough surfaces such as dirt, grass, and concrete. Specially designed polymer hubs with roller bearings are up to 40% lighter than steel hub wheels. Take a Rock N Roller R6 Cart to your next gig and save your back! Love the cart. It works for me. I have figured out that I can affix uni strut to the handles, and carry a ladder. But I wish, I had some sort of bag, that I could attach, that would allow me to use it like a wagon. I have nothing but good things to say about this cart. I do a lot of vendor shows and have several bags, boxes, and tables to transport for setup. When my first small hand cart broke, I needed to find something that would last longer and haul more items more easily. This cart does the trick! Both ends can be upright in either the short or extended version and NOTHING falls off my cart now while rolling from my vehicle to the venue. My back is bad and yet this cart is lightweight, folds and extends easily, and I could not be more pleased!! I have already recommended this product to other people! I love this cart. It does everything I hoped it would do. The only problem is my wife keeps borrowing it . A great product. Should have bought one years ago. Very convenient. Full cart mode for open venues, 2 wheel mode for crowded bars. Saves a lot of time and energy and packs up small enough to fit in any vehicle. A must have for any working musician tired of hauling gear. This is a great compact, allinone, hardworking multicart. Super easy to assemble. Carries everything I need. What used to take 4 trips with a traditional handtruck/dolly now takes 1 trip. Love it! I LIKE THE CART IT WORKED VERY WELL FOR WHAT I NEEDED THE ONLY THING THE WEIGHT IF THIS WAS MADE OF ALUMINUM THIS COULD BE SUPER EXCELLENT IF THIS STILL HAD A 500 LBS RATING . Overall the cart works well. I love this cart. I bought it to use moving a heavy bird cage outside on summer days. Needed a cart that was the height of my door sill, so I could just slide the cage, without having to lift it. With the front handle, and back vertical piece, the cage doesn't slide off. The cart moves so easily. I can even tilt the cart back and move up the step from the patio into the house with other loads. I knew when I ordered this for a specific job, that once I had it here I would use it for many other things, even in the house. I have back problems. And the whole thing fits under the bed to store out of the way. Couldn't be more excited and pleased. it has been a great addition for my work load, i am a courier and a deejay this hand truck really does the job well . i wish i could have gotten one more size up,but this little fellow does the job! This is my fifth Multi cart all are still working I love the solid tire models for carpet, concrete and tile. The r12 with air fill is great for gravel and over grass fields. This cart is awesome! Saves me time and effort. I am very happy I made the investment. Used to have to make 45 trips to load in to gigs with all my equipment. I make it in 1 trip now. Should have bought one of these long ago. I needed something that could fit in our apartment's closet, yet was sturdy enough to carry boxes back and forth to our storage unit. We're moving soon, and the storage unit is inside, on the 2nd floor, and you can't always find carts to borrow. The Multicart suited our needs perfectly. Load up the car with boxes and the collapsible Multicart, drive to the unit, and unload. It's also going to be handy when it comes time to pack all our stuff and move we're on the third floor and having a handtruck that can be easily transformed into different configurations is excellent. Excellent product! Easy to use with great results! Super fast shipping and the price was great too! Don't buy the knock offs, Buy the Rock n Roll Cart! really good value compared to others on the market. 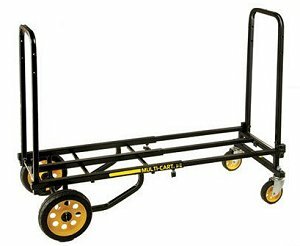 Ordered this cart because I do a lot of vendor shows and have a lot of inventory to take in. This sweet little cart has cut my trips in half. The size of it when it's folded makes it easy for me to get into my car and when I get to my destination and open it up it's amazing how much stuff I can get on it. The large wheels make it easy to go over thresholds in doorways. I'm anxious to see how it goes in the snow. The only thing that I wish it had was some way to lock the handle in place so when you pick the cart up it doesn't flop around. I'm going to see if my husband can attach some kind of Velcro strip to it. One of my rep friends loved the cart and may be ordering one too. Wellbuilt and rugged. Purchased to move heavy musical equipment around. Figured out how to unfold the cart for use as hand truck or dolly. Would be nice if the area you grasp when used as a hand truck was padded. I felt that the mechanical advantage was a little lacking when moving heavy items as hand truck, but could have extended the frame more, I guess. Tried to carry 440lb salt bags for water softener but had difficulty going over thresholds and minor bumps. Nice cart. Light weight design. Folds up compact. But last weekend at the gig ... I got careless and dump my very expensive head off the cart ... note to self ... strap gear to cart before hauling out of the venue ... other than that .. no issues with the cart ... very happy with it! Used it on three gigs and no complaints. Very efficent. Smooth operation. Great product, just slightly smaller than I anticipated. Well built and easy to assemble and cart with you. Great,light weight cart that holds a ton of stuff. I no longer dread multiple trips to and from the car to set up for events. Handle bars can be a little tricky to break down and pull back up couple pinched fingers, but once you figure it out, it's fairly easy. I belong to a train club that sets up at train shows, retirement communities and other special occasions. The cart helps me get all my trains, power supplies and decorations on one load and easily moves it from SUV into the location in one shot instead of the 3 or more trips, even with a hand truck, that it used to take. Plus it stores in a very small footprint in the back of the car. I love my R6, it is absolutly perfect for what it was needed for. Thank you for the great item at a great price. the product works great very easy to use and assembly took less than 5 minutes! Its has alrady saved my back quite a few time and everytime that i use it i am so happy that i made the purchase!